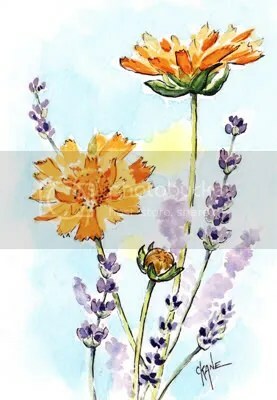 Garden Flowers Sketch – Let's Paint Nature! The blessings of summer are abundant! It is just a few weeks away until the first day of summer and I am already enjoying full blooms in the garden. How lucky I am to walk in my own backyard and reap the benefits. Truly grateful, I do not consider it a small matter. Here are a few carpet flower stems and lavender stems. I love the color contrast between the two. In my original, the carpet flower is not so orange, more of a yellow. I do not know why my scanner does that, it must not like certain colors. Anyway, yellow and purple are opposite on the color wheel, they compliment each other. Orange and blue are opposite on the color wheel as well, so the background color and the carpet flower color compliment each other also. When painting, try to remember how your color will play off each other and whether it is a good compliment or not so good compliment. Have fun in your garden; if you do not have one, try visiting a city or village park…and don’t forget your sketchbook!!! ← Let’s Paint a Summer Tree! Very pretty. I’ve often liked the orange/purple thing, personally. I combined them once while painting & came up with a shade I can’t even explain, but it was really pretty. Artswebshow: Thank you very much! Lana: Yes, the combo is striking! Thanks! Its really inspiring to paint flowers or gardens specially if your subject is your own garden. Love your paint and the colors you had used.